Click here for new Website! Christie and Anna work with our female incontinence patients to assure the most effective treatment modality is used specific to the incontinent patient. Above they are pictured with the Cystometrogram monitor. A CMG is often times done to help classify the type of incontinence in order to better direct therapy. They performed their first Percutaneous Tibal Nerve Stimulation (PTNS) for incontinence in February of 2013. This form of neuromodulation is increasingly being used as a non drug/non surgical treatment for overactive bladder and incontinence. We are pleased to offer this innovative form of incontinence therapy for our patients. Urgency incontinence occurs when a person has the urge to urinate but doesn't have the time to get to the restroom. This is a severe manifestation of overactive bladder and can be seen with interstitial cystitis. This an issue that is managed in a very similar fashion to OAB and IC. This issue is addressed on the OAB and IC page. 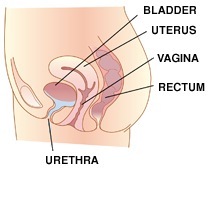 The most common cause of stress incontinence in females is a hypermobile urethra. With activity the urethra moves and in turn promotes the loss of urine. Sometimes the problem is an incompetent sphincter mechanism at the bladder neck. This is referred to as Intrinsic Sphincter Deficiency and is more difficult to correct. The use of urethral slings and bulking agents are in the surgical armamentarium of the urologist to correct these issues. Is commonly associated with pelvic relaxation "dropped bladder"